A lovely ‘stone’ appearance cottage with a stable door and charming shutter window. Your child will marvel at the unique feature of this playhouse – a real, working, magic doorbell! Now they will know when a visitor pops by to see them. Suitable for children age 2 +. 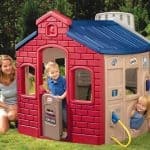 This gorgeous plastic playhouse will keep your children or grandchildren entertained for hours on end. Made out of UV resistant plastic means that it will retain its good looks for years to come and not fade plus it is easy to keep clean just using the hose every now and again. The bright colours will look great even on a dull day. In a shade of yellow and with red functional shutters and front door finished off with a green red roof it’s guaranteed a winning choice. 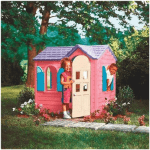 It is easy to assemble too meaning the children will be playing inside within minutes and this particular playhouse has added features such as a stable door and a magic ringing doorbell. Suitable for children age 2 +. With its appearance of a little cottage in the woods, the textured walls made to look like a cobbled stone wall give this house a somewhat more realistic appearance than other playhouses. If this is what you are looking for then you are on to a winner. Little Tikes Magic doorbell plastic playhouse: How safe is it? Constructed with the typical Little Tikes sturdy, lightweight materials, this playhouse is a wonderful addition to your garden, but does it have any features that raise any safety issues? We discuss below any possible safety concerns. Windows: The windows on this playhouse are completely open, apart from one shutter window feature to the side of the house. As with other Little Tikes playhouses, we can say that the shutters have an insert for little fingers to learn to open and close the shutters safely and with ease. Door: The little stable door is a charming addition to this playhouse, and can be opened by holding the top of the door or there is a useful handle in the centre of the door, preventing children from potentially trapping their fingers when opening and closing. Doorbell: The magic doorbell is a simple doorbell press function, creating no concern for safety whatsoever. With this playhouse, the only downside is that not all of the interior space is visible from the outside for parental supervision; however, with no internal fixtures or fittings, there is nothing that could cause potential harm to your child. The playhouses simplistic construction and design ensures that you are purchasing a house that is safe for your child to enjoy and spend many hours in without the constant need for a watchful eye to be kept on them. Overall, another excellent product within the Little Tikes range for your pre-school child to enjoy. 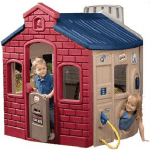 Little Tikes Magic doorbell plastic playhouse: How easy to build? 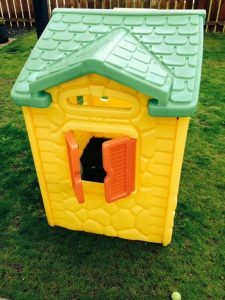 Similar to the other playhouses we have reviewed within the Little Tikes range, this playhouse is very simple to put together, only requiring one adult to do so. With no tools required, the click and build technology makes for a very easy assembly. Once clicked into place, all the components fit very nicely together, ensuring a very sturdy construction. With no interior fittings or accessories, there are no small pieces to worry about. The magic doorbell is inbuilt into the front wall; so again, there are no fiddly parts for parents to contend with during the construction process. 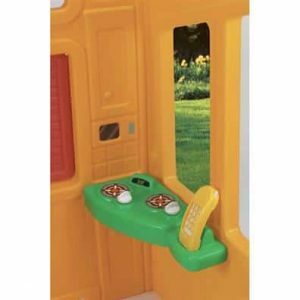 Little Tikes Magic doorbell plastic playhouse: What is the overall quality like? 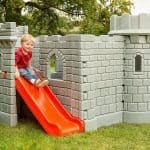 Here at whatshed.co.uk, we are big fans of products within the Little Tikes range. When you buy from Little Tikes you can always be sure that you will receive fantastic quality toys and products. 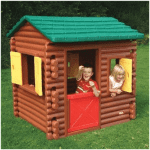 The design of this particular playhouse may be simple, but it is slightly different to the very traditional style of playhouse that we see within the range. If you are looking for a house with a fine attention to detail to capture your child’s imagination then this may be the house for you. The ultimate feature of this playhouse is the ‘magic doorbell’, a feature that will both excite and amuse young children for hours. After all, what could be more fun than having visitors stop by your house and ring the doorbell? This is a feature that will no doubt be popular with your child and their friends, especially when mum rings the doorbell to deliver their favourite drinks and snacks. Overall, we think this is a lovely little house for children from age 2 to 5 years and beyond to enjoy. At the mid-range price point it sits at, the wonderful and unique feature of a ‘magic doorbell’ will bring young children endless hours of pleasure. The overall layout and design of the house may be simplistic but the attention to detail and the doorbell will definitely sell this house to those of us who appreciate the little things in life. This is great for us because we knew what we needed for the ages we have. I will tell you that our kids are about one year younger than the ages it recommends but I am a stay at home mom that can monitor. We did this because we wanted more than just a few months use out of it because for the price they can grow out of it fast. However, it is a great walking and standing trainer when you use it with them. It’s great. I run a small day care centre and I always have to buy some sort of toys for the children. 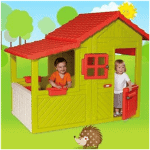 So when I came across this playhouse, I was really happy to find something fun and interesting for them. The rich energetic yellow, green and red colours will definitely lift the mood of the children. What’s more fun is the ‘magic ringing doorbell’, which the children go crazy over to play with. It wasn’t very expensive and the entire built seems very sturdy. Also it has UV protection, so there is no tension of fading or dying colours due to long exposures to the sun. And after the kids are done playing with it for the day, it is very easy and simple to clean it up. This playhouse has helped me a lot in handling the children, and I think that I might even purchase another one in the future.